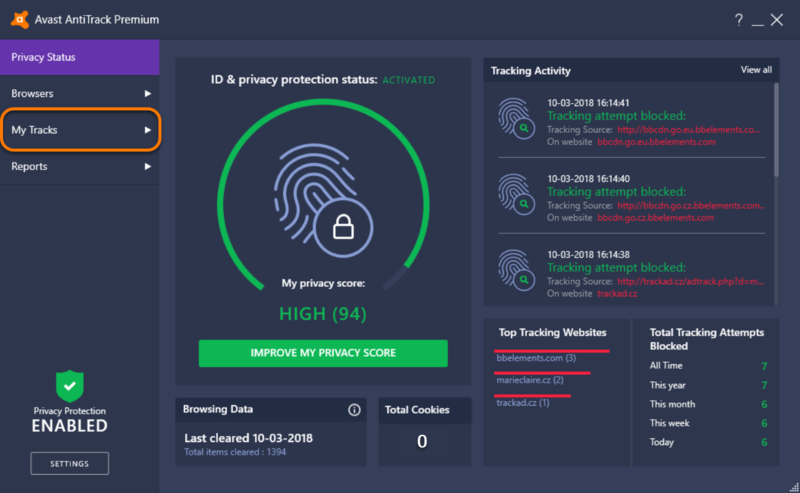 Avast AntiTrack Premium is a privacy application designed to keep your identity safe from the latest online tracking techniques. 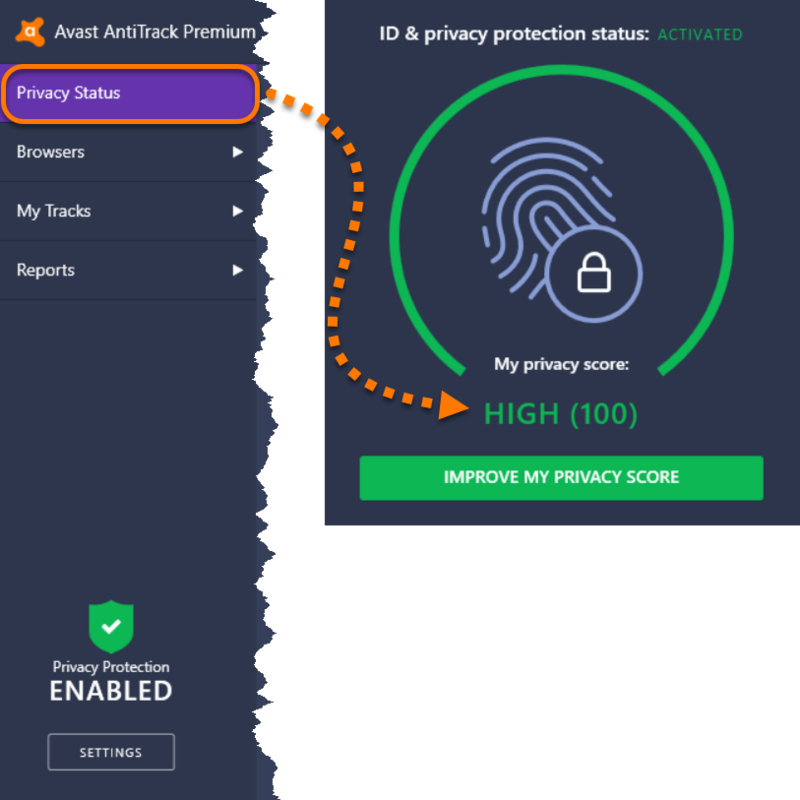 Refer to the sections below for information on how to get started using Avast AntiTrack Premium. 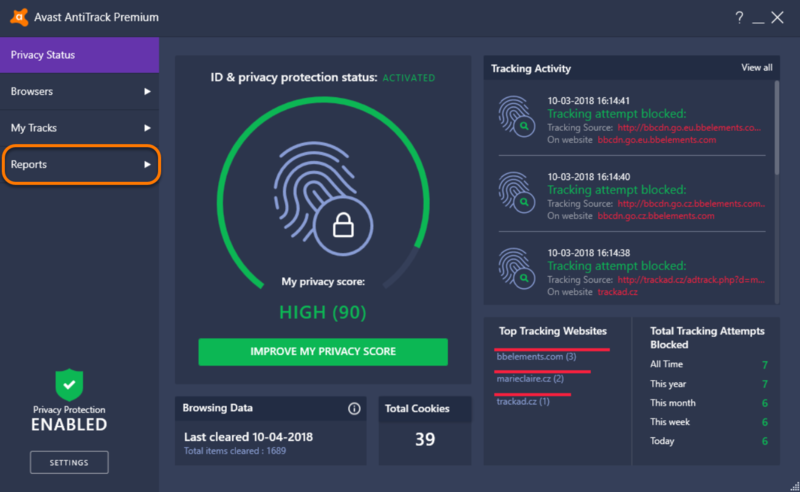 Click Improve My Privacy Score on the main Avast AntiTrack Premium dashboard. Ratings shown in red: serious issues that are preventing Avast AntiTrack Premium from protecting your online privacy. Ratings shown in yellow: suggestions to further improve your online privacy. Ratings shown in green: components that are enabled or configured effectively to protect your online privacy. 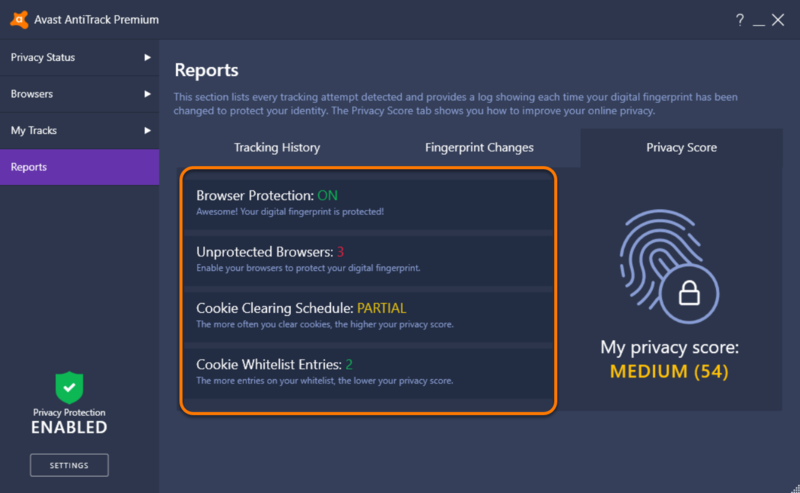 Click Privacy Status in the left-side panel to see your improved privacy score. 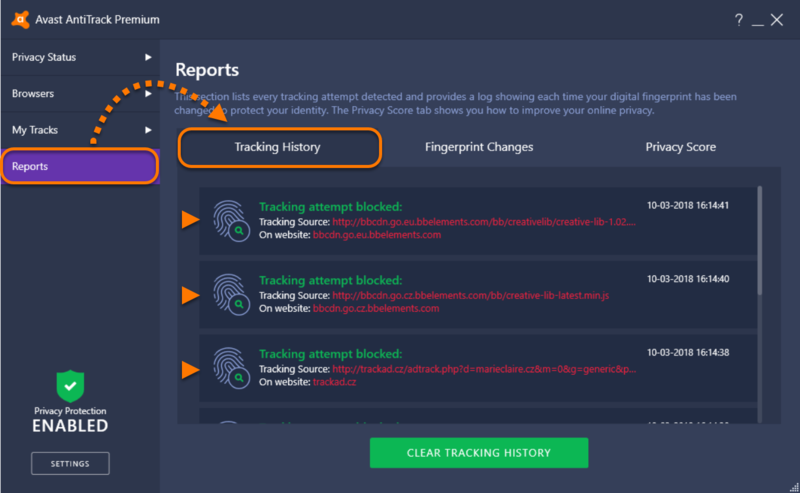 Avast AntiTrack Premium allows you to see exactly when tracking attempts are blocked and which websites are attempting to track you. 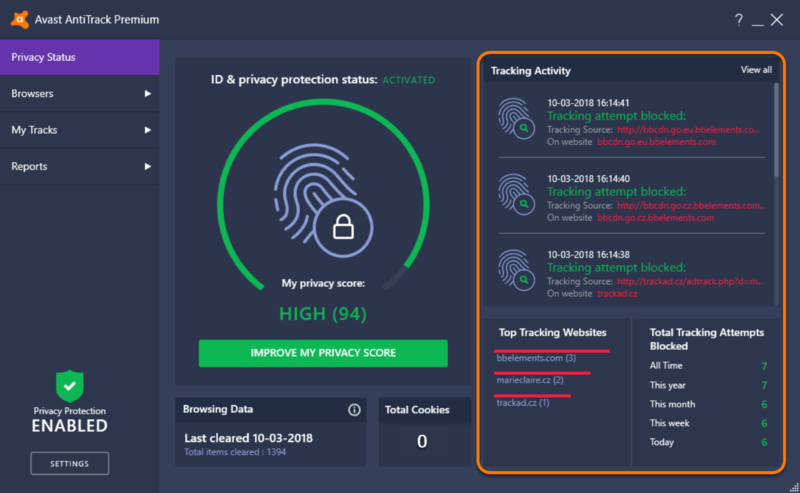 Tracking Activity: view the time and date of recent tracking attempts, the websites that tracked you, and the Tracking Source. Top Tracking Websites: The websites that have attempted to track you most frequently. Total Tracking Attempts Blocked: The total number of tracking attempts blocked by Avast AntiTrack Premium since you installed the application. To see your full Tracking History, click Reports in the left-side panel and select the Tracking History tab. Click Reports in the left-side panel. 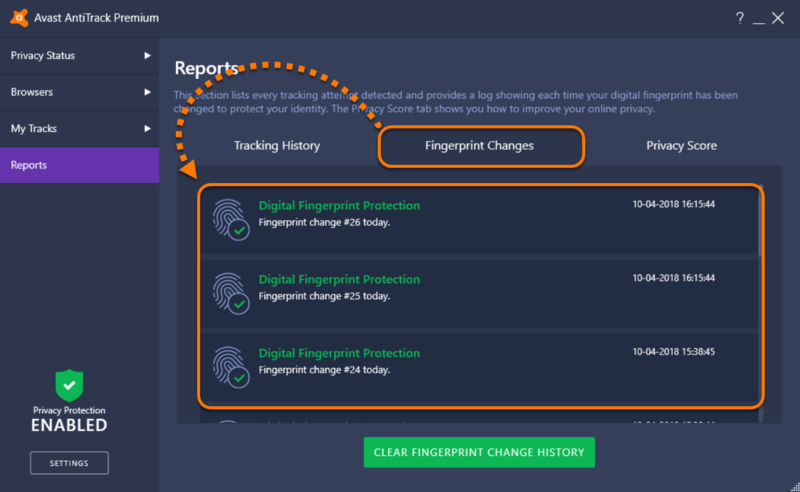 Select the Fingerprint Changes tab to view how many times your digital fingerprint has been changed and exactly when it was changed. Click My Tracks in the left-side panel. Use the Cookie clearing drop-down menu next to your chosen browser to select how regularly cookies are cleared. Cookies are now regularly cleared from the selected browser automatically. Tick one or more "popular" websites in the drop-down menu... ...or click the textbox, type a URL (for example, www.example.com), and click Add. 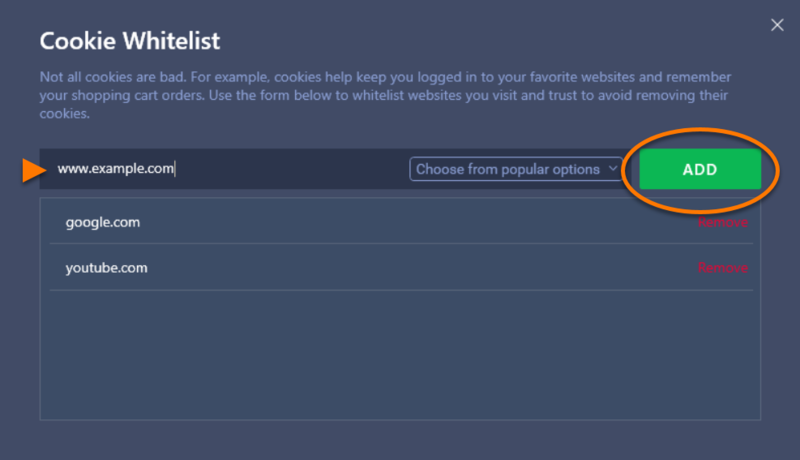 The selected websites are now excluded from cookie clearing and appear on your Whitelist. Tick the types of browsing data you would like to clear (or tick Select all). 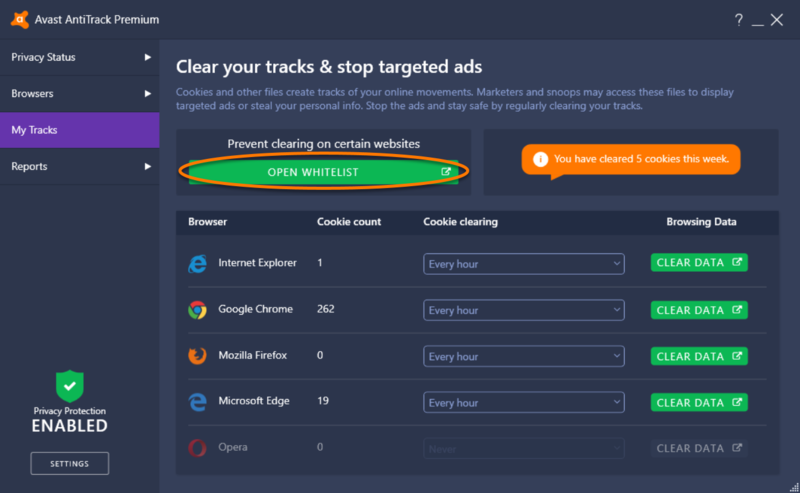 Optionally, tick Save my settings to ensure that Avast AntiTrack Premium remembers your preferred selections for all browsers each time you click Clear Data. 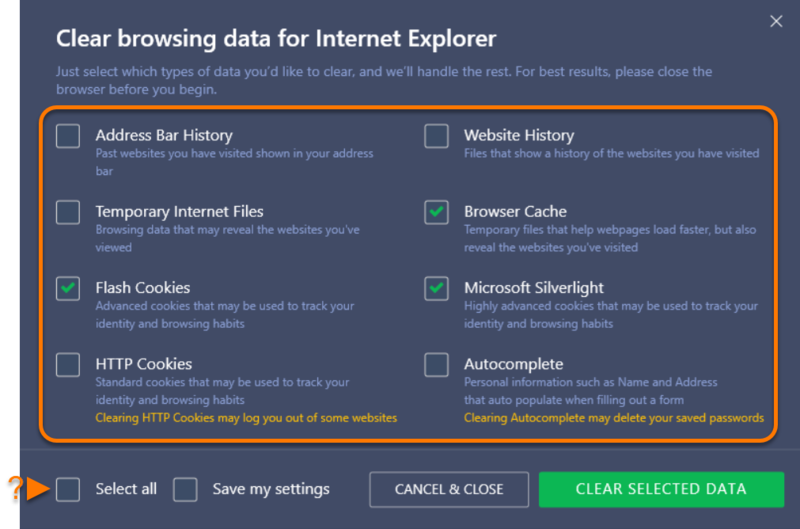 The selected browsing data is now cleared from your chosen browser. Enable Tracking Detection (enabled by default): allows AntiTrack Premium to write entries in the Tracking Activity record. 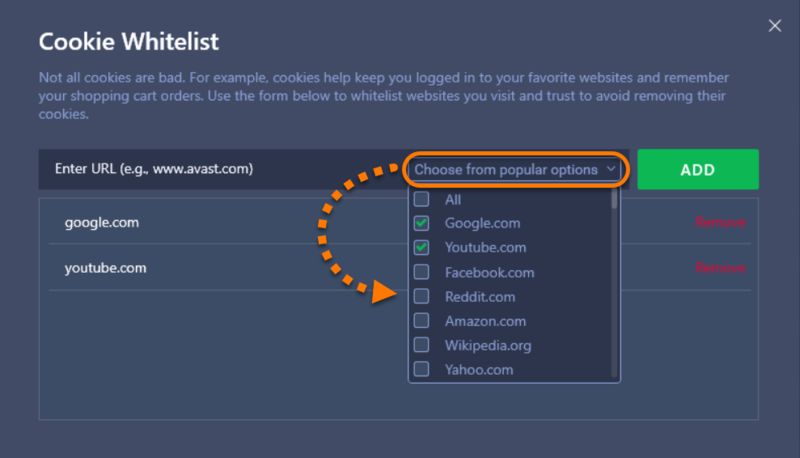 If you disable this setting, your browser remains protected, but Avast AntiTrack Premium does not gather data during tracking attempts. Show notifications for fingerprint changes: displays a notification each time your digital fingerprint is changed. 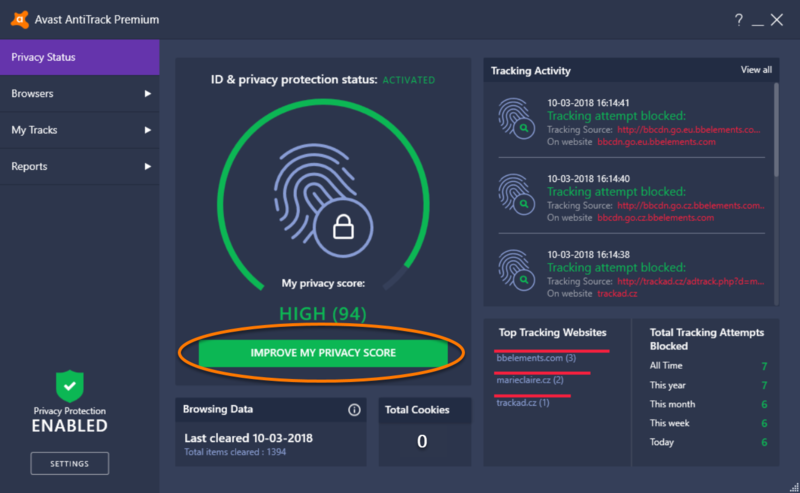 Start Avast AntiTrack when I start my computer (enabled by default): allows Avast AntiTrack Premium to start automatically each time you turn on your PC. Minimize AntiTrack Premium when started: minimizes the Avast AntiTrack Premium interface at launch. Notify me of blocked tracking attempts: define how often you want to see notifications about blocked tracking attempts. Select Never to disable notifications. Select language: click your preferred language, and click Yes to confirm. Subscription Status: view your Activation code. Updates: view your current program version and confirm that it is up to date. If you think your program version may not be up to date, click Check For Updates to download and run the latest version of Avast AntiTrack Premium.